During the time of the French King, Louis the XI, the latter part of the 15th Century, the hunting horn had developed to a point where it was used for a kind of musical hunting code. These calls progressed to a high musical order and eventually found their way into the orchestral scores to be played on the “French Hunting Horn.” Thus the name French Horn. In 1753, a man by the name of Hampel of the Dresden orchestra incorporated changeable slides directly in the body of the French horn, somewhat as tuning slides are inserted in horns today. He also found that inserting the musician’s hand in the bell not only softened the tone but raised it a semi-tone. 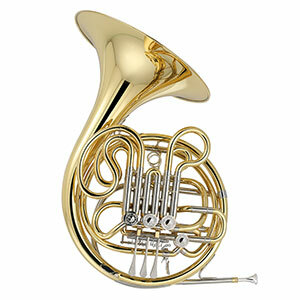 Modern single French horns are built in the key of F or Bflat. 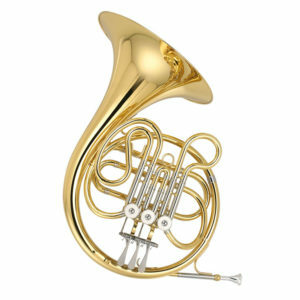 No other brass instrument can equal the French horn in velvety tone, playing range, dynamic expression, and variety of effect. Expressive as a solo instrument but having a unique quality of tone, it blends well with strings, woodwinds, and other brasses.